How Do You Know It's Time To Replace Your Water Heater? When it comes to modern comforts, hot water has to be one of the most important. We’re lucky to live in a country where hot running water is commonplace and when we don’t have hot water it can have a big impact on our lives. Almost every home in Perth has a water heater that provides hot water to your taps. But how often do you inspect your water heater and know that it’s in good condition? Most of us wait until our water breaks before we even think about replacing it, but that could mean several days without hot water in your home. To avoid that happening, it’s a good idea to keep an eye on your water heater’s condition and look at replacing it before it breaks down. 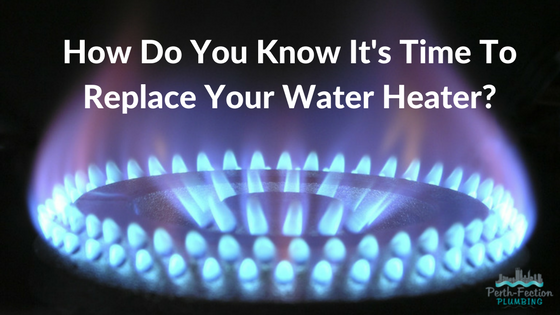 But how do you know when it’s time to replace your water heater? Your first sign is the age of your water heater. When was it installed? Try and find out before you buy a property so you can estimate how much life it has left in it. Most water heaters last an average of 8-12 years. If they are well-maintained they could last longer, and conversely, if they aren’t looked after they may not even last as long. Is your water heater making strange noises? Does it rumble when it heats up? Sediment can build up at the bottom of your tank and as it solidifies it can knock against the walls of the tank as it heats the water. Not addressing this issue can result in permanent damage so get this looked at as soon as you notice any unusual noises. If there is any moisture visible around the water tank it may be leaking. If you can’t see where the leak is coming from, it would be a good idea to call a plumber so they can investigate exactly where the problem lies. Depending on where the leak is, it could either be repaired or it may be time to replace your water heater. Water heaters are generally situated outside the house so will be exposed to the elements. This means that they are susceptible to rust. However, if your water heater is progressively becoming very rusted, it may well be time for a new one. Not addressing this could lead to leaks and then it will definitely need replacing. Rust-coloured water is another sign that it’s time to replace your water heater as the heater may be corroded. How hot is your water? If your water isn’t as piping hot as it used to be, it may be a sign that there is a problem with the heating element. Over time they will start to deteriorate so if your water heater is quite old, replacing it may be a good idea. A good plumber will be able to find the source of the problem and advise the best course of action. If you’re concerned about your water heater, contact our plumber in Perth for a free diagnosis and quote today. We can help with all aspects of residential plumbing and commercial plumbing for your Perth home or business. Call us today on 0451 781 384.